Will Sean Spicer Be on SNL Tomorrow? Do you think Sean Spicer will be on Saturday Night Live tomorrow? I think Sean Spicer will be on Saturday Night Live tomorrow. If he’s not on tomorrow then I will repeat this question every week until he is, or until I am proven horribly humiliatingly wrong. Bring it on. Here’s why I think Sean Spicer will be on SNL: everything else that has happened. Specifically I am referring to his appearances on Jimmy Kimmel Live!, hosted by Jimmy Kimmel, and the Emmys, hosted by Stephen Colbert. In other words, something like 20% of the late night comedy establishment has already deemed him safe to do bits with. The latter appearance was an obvious nod to SNL, which as an institution has scarcely a fraction of Colbert’s (inconsistent) moral compass; it’s tough to imagine comedy’s biggest beater-of-dead-horses hesitating to trot out Spicer for a few quick laughs and a viral video. Just yesterday the show announced it’s adapting “David S. Pumpkins,” one of the one good sketches it produced last year, into an animated Halloween special. Clearly NBC took the, er, rousing success of Weekend Update: Summer Edition as a sign that it should milk every cow it’s got, and Sean Spicer is a mighty fine cow, plump with the smooth white drink of ratings. Mmmm, baby. Plus, it’s safe to take it as a given that Spicer wants on. He’s been working ever so diligently to rehabilitate his image, after all, and SNL would be huge. He’d get laughs and selfies with all the hot celebs and then dominate social media for a day or so. What does a man with no soul have to lose? 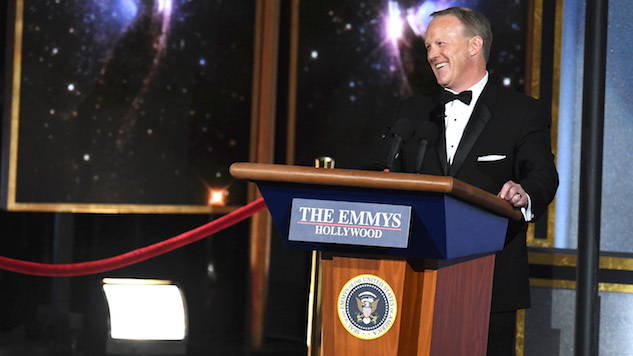 I suppose one could argue that SNL may have witnessed the flack CBS took over the Emmys, thought long and hard about how much a joke is worth, and concluded that now is not the time to let Spicer in on the joke. One could, I suppose, argue that. But I might argue back that given the choice, SNL will choose ratings over moral integrity. The show has let many bad people in on many bad jokes, jokes that amounted to little more than “Haha, look at me, I’m that guy who did that stuff!” SNL might be great for the occasional few minutes of catharsis or escape, but it generally only cares about right and wrong insofar as adopting a moral stance—any moral stance—is useful in getting the laugh. Spicer will get that laugh. It won’t be a good laugh, but that’s never been the endgame. Still, the possibility remains that the universe is better and more just than two comedy shows that had Sean Spicer on. Wouldn’t that be nice! Here’s hoping.